The PSA collaboration brings together researchers not only from the Netherlands and China but also from other countries working in the Eindhoven and Dalian groups. 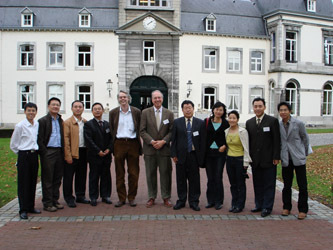 The group leaders meet frequently in China and the Netherlands and several workshop have been organized. Besides, the Social aspect of getting to know eachother’s cultures is an well-appreciated aspect of this international collaboration. On this page you will find some impressions of the Social context of our collaboration. 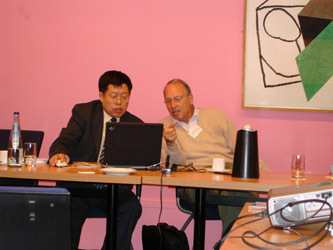 Professors Can Li and Rutger van Santen in a scientific discussion at the second progress workshop in Kasteel Vaeshartelt in december 2006. Researchers Yejun Guan and Ying Li attend this workshop during their one year research visit to the Eindhoven group. Yejun Guan is now a postdoctoral researcher at University of Twente. Ying Li has become full professor at Zheijiang University of Technology in Hangzhou, China. 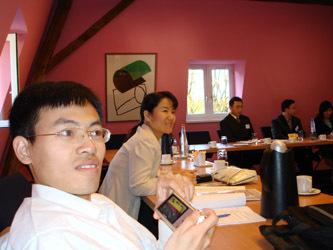 Participants of the second PSA workshop held in Maastricht (the Netherlands) in 2006. Zhaochi Feng and Ying Li join forces at the science parc at the museum Neeltje Jans. Emiel Hensen visited Dalian end of 2006 to discuss the next steps in the program. 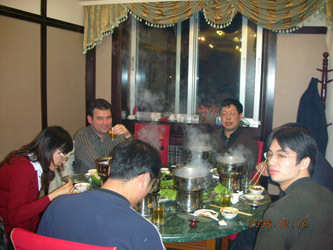 This picture is taken in a restaurant serving the famous Hot Pot dish. 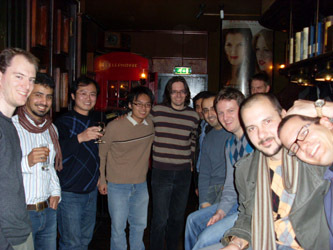 Goodbye party for Hongchuan Xin (visitor in Eindhoven in 2008) at the ‘Trafalgar Pub’ in Eindhoven.